The first incubator session of the D-JIL project was held in Tunis on 14 and 15 November 2018. The ten selected project holders met up to undergo training, exchange ideas and move forward with their initiatives. The two-day seminar, to be followed by a further five over the course of the project, was held in the offices of Al Khatt, a think tank and space for reflection on the future of journalism in the era of the Internet founded by Malek Khadhraoui, a winner of a previous CFI project, EBTICAR, supported by the European Union. The event was attended by two representatives of each of the ten projects, along with partners, and was an opportunity for all the winners to undergo training in European project management and ICTs (Information and Communication Technologies). The training was provided by Florence Minery and Francesca Valli (CFI), Colin Verot and Malek Khadhraoui (Inkyfada/Al Khatt). The latter in particular was able to share his experience as a former recipient of a similar grant, and proved to be an inspiring example for these new project holders. 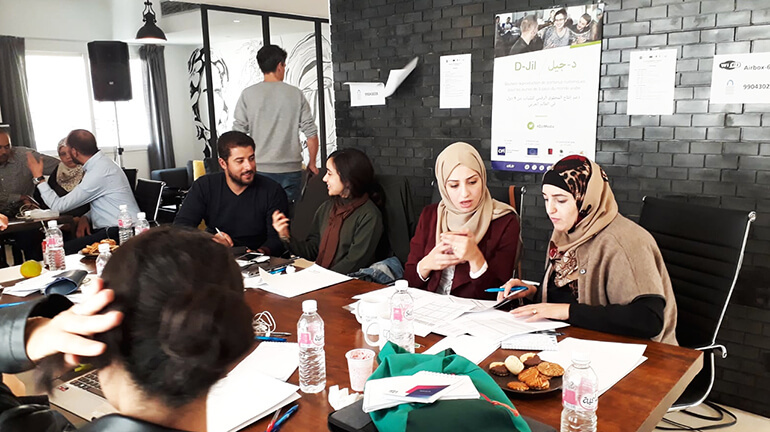 Co-financed by the European Union and supported by CFI, in partnership with the Samir Kassir Foundation, FMAS and IREX Europe, the D-JIL project aims to foster active citizenship and autonomy in young people in 9 countries of the Arab world by using online media as a vehicle.